Henry Whitwell was born in Leicester in 1883, but spent most of his childhood living on Woodgate in Rothley. He was one of the first pupils at Rawlins School, which opened in Quorn Village Hall in 1892, before moving to their present site in 1897. 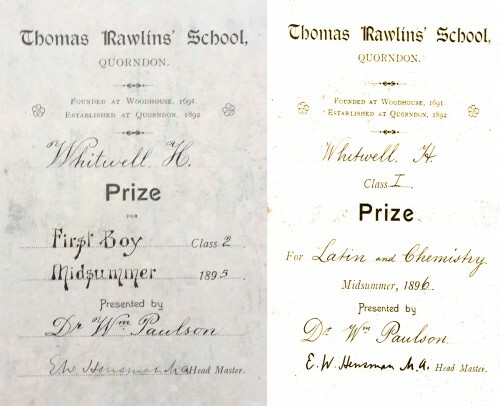 Henry was the recipient of at least two school prizes, in 1895 and 1896, ie when the school was still at the Village Hall. The first certificate (below), dated 1895 was inside a copy of ‘History of the Conquest of Peru’ by William H. Prescott, and the second was inside ‘Cassell’s Complete Book of Sports and Pastimes’. Copies of these certificates were kindly sent to the museum by Henry’s grandson, John. Henry went on to be a teacher, and from 1928 to 1944 he was Headmaster of Green Lane Senior Boys’ School in Leicester. Together with a colleague, Thomas Rowland Goddard, he wrote a series of arithmetic books called ‘New Confidence Arithmetic’.